In spite of all the spectacular news stories about advanced persistent threats and targeted hacks from nation-states, the most common security challenge facing enterprises today continues to be social engineering. Successful hackers know the user is the weakest link in the security chain. Email phishing campaigns have proven to be the path of least resistance to get unsuspecting individuals to download and install their malicious software. 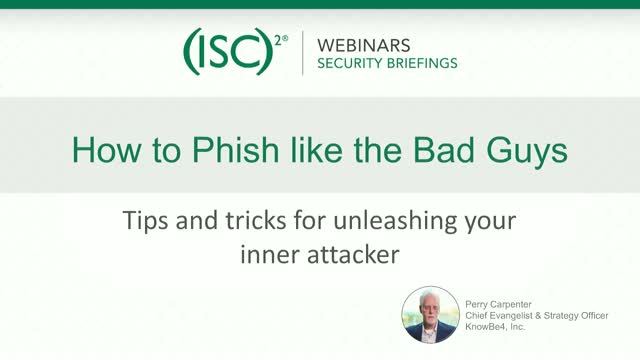 Getting users to identify phishing attacks and training them not to click on links in email messages is not a trivial task. Join KnowBe4 as we discuss the strategies and techniques that social engineers are finding success with, how to implement these techniques and to create real-world simulated phishing email to test your employees and see how phish-prone they really are.